Two boys meet on a voyage that transforms their lives. Madu, a young African, is captured by the English slave-trader, Sir John Hawkins. Tom Oakley is a young sailor in charge of the slaves. At first the two boys hate each other. Madu wants freedom, Tom seeks revenge for his cousin whom the Africans killed. But when their ship is sunk in a battle with the Spaniards, their roles are reversed, and Madu gains power over Tom. But both boys are enslaved, thousands of miles from home. Only by combining their efforts do they have any chance of freedom. A fast-moving drama based on real historical events. History as you never learned it in school! 'I read this book in one sitting. I could NOT put it down! I felt like I was watching a movie unfold that kept me absolutely riveted from beginning to end.' Jesse Norman. 'I could not put this book down. It should definitely be part of the American School curriculum. I learned so much and it filled me with a new passion for historical fiction. The author has created a sensory rich atmosphere filled with characters and locations that come to life. The book enables us to put ourselves into the skin of a young African boy and see, smell, hear and feel all his incredible adventures and horrors as clearly as if we were there.' Michelle M, Amazon reviewer. 'Marvellous ... 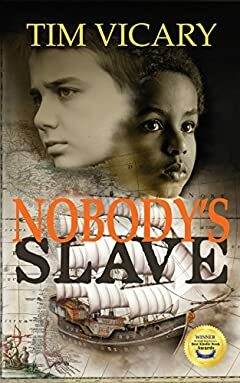 I almost think that this book should be taught in the high schools as it gives such a human "face" to slavery in Africa at the hands of the English. Highly recommended.' Brenda Maxwell. 'A literary epic adventure ... an EXCELLENT story.' Samantha Ryan. 'A fast-paced tale of danger, adventure and drama ... deeply steeped in historical fact, and with real characters from the past.' Mark Williams. 'Tim Vicary's clear and fluent style is, as always, a delight to read and his research is impeccable. The world he presents is utterly believable, his characters live and breathe. An emotional roller-coaster of a book. 'Author Jenny Twist. 'Definitely recommended to fans of historical fiction, or anyone who enjoys and intense and fulfilling read. 'Stacy Decker.